I found Koda Rohan's short novel The Five-Storied Pagoda accessible* because I was able to slide it into a genre, stories-about-artists, that I understood. The Pagoda, Skull & Samurai collection includes two other stories where my luck was not so good. They are even easier to fit into genres, but ones about which I know nothing. Encounter with a Skull (1890) is a Japanese ghost story, with a strong religious theme. The renunciation of the flesh literalized, maybe. There also seems to be some relation to idealized travel narratives like Basho's Narrow Road to the Interior. Parody? Homage? No relation at all? The Bearded Samurai (1896, I think) is even trickier. The novella covers events before and after the 16th century battle of Nagashino, an important episode in the establishment of the shogunate. Fictional and historic characters are mixed together. Long scenes involve characters debating the value of life, or the importance of duty. It's sometimes a bit like the Bhagavad-Gita, actually, and also has some resemblance to Icelandic sagas, and to European medieval chronicles, like Froissart. It's true sources, the Japanese chronicles, the Tales of Heike, and 17th century stories of Ihara Saikaku, are completely unfamiliar to me. In other words, I'm flailing. The Five-Storied Pagoda had something of the taste of a new discovery. The Bearded Samurai, on the other hand, is a Project for Future Research. Read one book, read another, read another. At some point, some light begins to shine through. There are no secret ways to learn new things - just try and try again. I'm ignorant, but curious. Not many 19th century Japanese writers have made their way into English. It takes Donald Keene 300 pages of Dawn to the West, his history of modern Japanese literature, to get to Soseki, the first writer with an international reputation. So, merits aside, there's plenty of writing in the 19th century. What are the merits? Pagoda, Skull & Samurai is a collection of two novellas and a ghost story, all from the early 1890s, by Koda Rohan. All three stories are interesting in their way, but the novella The Five-Storied Pagoda (1891-2) is especially accessible. That does not sound like such high praise, I know. It's an acknowledgment of my limitations. 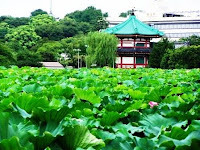 A Buddhist temple is going to build a five-storied pagoda, presumably much like the one to the left that I saw at the Senso-ji temple in Tokyo. Two master carpenters (and architects, really), the successful Genta and the pathetic Jubei, both apply to build the pagoda. The saintly abbot makes the two men figure out the problem for themselves. Rohan was known, and apparently criticized, for stories like these, with real ethical dilemmas and no villains. I find - I think most modern readers will find - the story to be pleasingly complicated. What do we want with a villain? Jubei the carpenter may be a fool but he is also, we discover, a real artist, creative and individualistic. It's this strain of the story that makes The Five-Storied Pagoda accessible. I'm used to reading stories about artists' problems - their role in the world, the sacrifices they make, or don't, for their creativity. 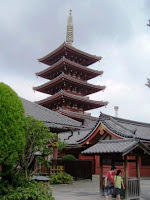 The Five-Storied Pagoda puts these familiar themes in a new context. New to me, anyway. A complicated and rewarding trip. I have a few notes on Lady Isabella Bird and Koda Rohan, and maybe about a Kubuki performance, that should move me right back into 19th century books. 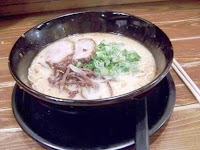 I never set foot in a restaurant I'd heard of, with the exception of two stops at Starbucks, and those were both instigated by Japanese people. I never asked for a fork, although I used it if it was there. A month was not enough to straigten out basic greetings and farewells. Next time. Two curiosities about Jiro Osaragi. I mentioned yesterday that Osaragi was a sort of a French Japanese writer. His museum contains his enormous archive of French historical documents, with a particularly rich store of material about the Dreyfus affair. It turns out that during the 1930s Osaragi wrote a historical novel set during the French Third Republic, about the Dreyfus affair. He wrote a novel about France as a way to criticize the Japanese military government while evading the censorship. 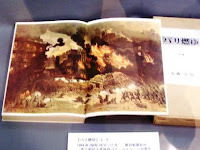 After the war, Osaragi wrote two more novels set around the same time, one about the corruption scandal surrounding France’s attempt to build a Panama canal, the other about the 1870 Siege of Paris and the Paris Commune. I think that's it on the left. I would love to read one of these novels. 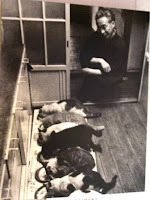 Second curious fact about Jiro Osaragi: the man loved cats. At one point, when he moved to a larger house, he did not sell the old one, but gave it over to his eighteen cats. So he kept two households, one for himself, one for his cats. 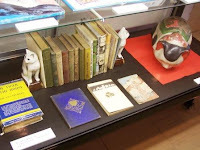 The Jiro Osaragi Memorial Museum is full of, aside from his books and papers, his collection of cat-related stuff. Statues of cats, for example, including the waving cat figurines one sees at Chinese restaurants. Also, paintings of cats. And books about cats. One of these is called Cats for Pleasure and Profit. The architectural details of the building, such as window frames, sometimes incorporate cat designs, although I could not get a good picture of any of them. No living cats, though. 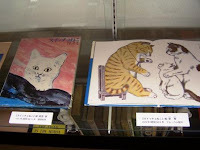 Any cat lover visiting Yokohama would be a fool not to plunk down their 200 yen and see this museum. 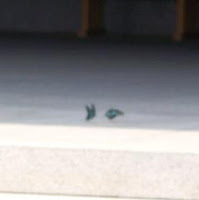 The Jiro Osaragi Memorial Museum - who? Last weekend I visited Yokohama, where I strolled into the Jiro Osaragi Memorial Museum and discovered a few surprises, even though almost every word was Japanese. Almost – some were French. Osaragi was a 20th century Japanese writer who was immersed in French literature. Romain Rolland was a particular favorite, and Osaragi translated Rolland into Japanese. Maybe this is part of the reason I had never heard of Osaragi. Rolland’s reputation is not so healthy now, either. On one wall of the museum one can see Osaragi’s complete sets of Hugo, Baudelaire, Merimeé, Zola, Flaubert, and others. Only two books in English, both by the author. These two novels are The Journey and The Homecoming, as far as I can tell his only novels translated into English. 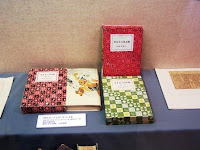 The latter book has the distinction of being the first Japanese novel translated into English after World War II. Both novels are actually about the American occupation, so the interest at that time is understandable. Both are in print (both in Japanese and English) in Japan, at least, and both are available for a pittance, used, at Amazon and Powells. The topical subjects make me curious about the quality of the novels. Are they imitative of styles that are now unfashionable? Are they period pieces, of interest only to students of that time and place? Or is this another fine writer crowded out of the foreign market by the bigger names? 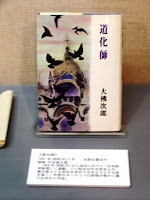 Kawabata, Soseki, Tanizaki, and so on. Quota filled. No room for Jiro Osaragi. He also wrote a series of best-selling samurai novels, so snobbery, maybe? More simply, is he worth reading? He does seem to have a few more of his books available in French. That leads to one of the two most interesting things I learned in the museum, but I’ll save those for tomorrow. 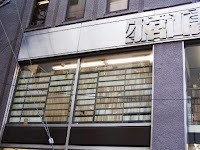 The museum contains Osaragi’s archives, as well as his books and memorabilia. In America, this would all be boxed away in some big university library. 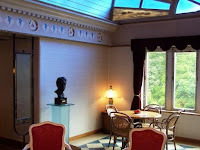 In Japan, it’s in a charming, elegant museum* that has its own tea shop. * Best I could do for a link. Don't bother with the "Official Site" button - it's for - I don't know what. Yokohama tourism? If it doesn't, it's no arrow, it's no poem. The poet is Nannecoda, the time is the late 10th or early 11th century, the language is Telugu, I think, but Sanskrit scholar David Shulman uses this poem to describe classical Sanskrit literature. The poem can be found in this review of the Clay Sanskrit Library in The New Republic. The Clay Sanskrit Library is an ongoing series of translations of classical Sanskrit literature, with 41 volumes published since they started three years ago. The two centers of the series are the great early epics, the Ramayana (which will fill 8 volumes) and the Mahabharata which requires 32. 32! There has never been a complete Mahabharata in English, and Shulman says that “the Indian tradition tells us that the text is so powerful, and potentially so destructive, that is positively dangerous to attempt to translate it, or even to read it, from beginning to end.” They’ve got 13 volumes done now, so wish them luck. Shulman could hardly be more enthusiastic about having these works available in English. He admits that most past English translations of classical Sanskrit books are terrible, sometimes close to unreadable (like “Shall I set in motion moist breezes by (means of ) cool lotus-leaf-fans which removed languor?”). He has some criticisms of the CSL series, but for the most part he thinks that English readers now have a way in to a difficult but rewarding literature. The updated versions of the playwright Kalidasa seem like must-reads to me, especially Goethe’s favorite The Recognition of Shakuntala. But there is also a long list of works that are new to me, and although Shulman does not literally recommend them all, his advice is to just dig in. He even recommends reading chronolgically, using Sheldon Pollock’s The Language of the Gods in the World of Men as an overview. This is my kind of review - useful. The Clay Sanskrit Library would make a great blog project, hint hint. Who wants to blog the Mahabharata? You will have at least one reader, I promise. This will not be my project, no no no, since I have publicly declared that I will read Asian literature non-neurotically. I’ll just check the library, dip in, and see what’s what. I’ve read the William Buck adaptation of the Mahabharata and the R. K. Narayan Ramayana, both of which reduce the huge mass of poetic material to fast-moving stories in 300 pages or so of prose. These are both wonderful books. The Mahabharata is akin to, roughly, a Homeric epic, while the Ramayana, with its beloved monkey god Hanuman, is more of a mythological story. I can hardly imagine, though, what the originals must be like. The Clay Sanskrit Library Mahabharata, for example, will be somewhere around 10,000 pages in English. A friend who grew up in India has told me that although everyone knows the stories of the two great epics, it is typically through comic books or movies. The comic books often emphasize specific ethical lessons. The sacred Bhagavad-Gita is actually an episode of the Mahabharata, although I don’t think the entire epics are thought of as sacred books. Or are they? My real question is, how do people actually read them? I know the stories already, so should I just pick a volume at random? I described Shulman’s article as essential. If you are at all curious about classical Sanskrit literature, it really is. I was actually planning to make a point linked to what I have been discussing all week, the use of a literaty education. But I find myself more curious about these books than in the ideas they suggest to me. Maybe that's my point. So says Joseph Epstein in the article I mentioned yesterday. This statement is obviously wrong, in the sense that by “we” he just means “I, and people like me.” Kazuko Okakura and I suspect William Deresiewicz have learned rather different lessons. But I’m in Epstein’s camp. Careful with those Big Ideas – you might hurt somebody. Epstein points to Theodore Dreiser as a great writer who was a sponge for bad ideas. Balzac is an example from my own recent reading. These were writers of high intelligence who were suckers for nonsense (“a man who fell for Stalin and Hitler both,” as Epstein describes Dreiser), yet they both wrote novels as great as anyone’s, and the best parts of their books are full of well-observed details about human nature, characters worth knowing, themes that are banal on the surface but rather more meaningful deep down. They are not sugar-coated philosophy or symbolical representations of Big Ideas. To use Epstein’s examples, who wants to read Proust as a study of Bergson’s ideas about the nature of time, or Thomas Mann as a study of the rise of fascism? If you’re so interested, why not go straight to the source? And in fact almost no one, no non-professional, gives much of this sort of thing a second thought. But Proust’s ideas about how people have different identities in different circumstances, or about snobbery, or jealousy – this is the good stuff, right? To the extent that there is wisdom here, though, one doesn’t simply grasp the principle, incorporate it into one’s life, and move on to the next idea. Or if that is what you do, let me know how that works. I know that I am often too reluctant to pursue meaning, that I am too quick to turn an author’s ideas into The Author’s Ideas, allowing me to dismiss them. This, by the way, is one of my answers to the test question about my intellectual flaws. Fear of meaning. Let’s drop the subject. The positive side of all this is that I expect the process by which literature turns facts into ideas to work slowly. That's how it works for me, at least. This is part of my sanguinity about conditions at elite schools. Patience, Professor, patience. You’ve pointed the youngsters in the right direction. Check back in twenty years, or thirty. * Even if they are as resistant as I am, that may be long enough for some ideas to slip through. * Epstein informs me that Willa Cather refused to allow school editions of her novels. She thought that high school students, at least, were too young for her books. Was she wrong? No college for George Eliot, Joseph Conrad, or Ernest Hemingway. That’s off the top of my head. Isaac Bashevis Singer got as far as dropping out of the Tachkemani Rabbinical Seminary in Warsaw. Then there are the bad students – Theodore Dreiser, Henry James. James did give Harvard Law School a try. A lot of writers fall into this category. Joseph Epstein, for one. He’s the product of an elite education, with an English degree from the University of Chicago. But in a talk published in the latest issue of The New Criterion (“A Literary Education”), he describes himself as the sort of student that teachers don’t remember. No, not the sort of student – teachers he met later in life never remembered him. He was neither the “good student” who figures out what the teacher wants and gives it to him (that was me), nor was he the passionate student, excited to plunge into the subject, the sort of student he would later, when he was an English professor, especially value (also me, I hope). I was the good student, but I had almost exactly the same experience in a freshman English seminar, “Innovative Fiction,” taught by an excellent but decidedly non-innovative novelist at Big State U. ** We read Madame Bovary, and nothing penetrated, although I could give the teacher what he wanted. Next was A Portrait of the Artist as a Young Man, and something began to rattle around in an empty part of my head. The Sound and the Fury finally did the trick. Borges, Nabokov, and Calvino came next, and I read them with growing enthusiasm. The mental category where I had put fiction was now much too small. Literature, it turned out, contained the world. The more I read then, the more I read now, the bigger that world seems to get. Joseph Epstein is a superb essayist, first-rate short story writer, elegant raconteur, and fine critic. In his case (elite), and in mine (much less so), the university did what it was supposed to, but not in a way that was specifically predictable. I don’t want to hang too much on the Deresiewicz piece, which is obviously based on an idiosyncratic reaction to his students and his employer. I am more interested in his reaction to literature and what he thinks it can do, in the classroom or outside of it. His privileged students may not be getting everything out of Emerson that he demands from them. But I don’t see how he is so sure that some version of Joseph Epstein is not sitting in his class, never raising her hand, but slowly realizing that there are some surprising things going on in these books. How else is a liberal education supposed to work? More on Epstein tomorrow. His talk is available at the website of The New Criterion, but I believe it costs $3 or some such nonsense to read. I understand that libraries often subscribe to magazines. * I’ve lapsed into open mockery, but I don’t see how “he doesn’t really mean what he’s writing” is a good defense here. Or, here's another try, he learned that there "were" smart people who didn't go to college, but not that there "are" such people. ** If I ever relax my anonymity, I should write an appreciation of this teacher, and a couple of others. So alien was his experience to me, so unguessable his values. There’s this essay, from The American Scholar, that’s been eating at me, and entertaining me. It’s by William Deresiewicz, until very recently an English professor at Yale. Deresiewicz tells us that he finds, or found , it impossible to talk to his plumber. “So alien was his experience to me, so unguessable his values, so mysterious his very language,” and so on. That a guy named Deresiewicz can’t talk to a plumber still cracks me up, but even funnier is that this isn’t even the point of the essay. Because it’s not Deresiewicz’s fault that he’s snobbish and anti-social, but rather the fault of his elite education. That’s precisely what he says. Elite education “makes you incapable of talking to people who aren’t like you”. Yeah, pal, you. “My education taught me to believe that people who didn’t go to an Ivy League or equivalent school weren’t worth talking to, regardless of their class.” This message was “unmistakable.” So if you – is it still you? – went to an Ivy and missed this message, you must have skipped too many classes. And your parents scrimped and saved and sacrificed so much so you could go there. For shame. Deresiewicz advocates a return to a more humanistic model of education, although he gives few hints as to what that might look like. Based on his weird, gratuitous crack at the Yale economics and computer science departments, it must involve forcing students in the sciences and social sciences to take more humanities classes. Yet he doesn’t seem to think that the literature students are any better. So what happened? I was thinking that maybe Deresiewicz should spend some time with the farmers and carpenters in Adam Bede. JD at What Do I Know?, who pointed me towards this essay, recommends Rabelais, a powerful cure for many ills. But I don’t think they will work here. Deresiewicz is the author of one scholarly book, titled Jane Austen and the Romantic Poets. That’s right. He’s a Wordsworth expert! He has read and reread “Michael” and “Resolution and Independence” and they were useless to him. His education was just that damaging. William and Dorothy had no problem talking to that leech gatherer, although come to think of it he was a voluble fellow, and now I realize that the fault may lie with the shy plumber. In Mansfield Park, a girl from a poor family is taken in by her rich relations. Fanny is abused and ignored, and her snobby cousins sometimes have trouble knowing how to talk to her. A key sequence of the novel is when Fanny returns to her poor family after many years and finds herself horrified by the noise and disorder and bad behavior. In her most virtuous act, Fanny manages to take one of her younger sisters with her when she returns to the rich family. Deresiewicz is an expert on this novel, too. Some of this may be unfair, but Deresiewicz specifically criticizes his Yale students for failing to recognize the useful lessons contained in literature. For example, they can’t see why Emerson, in his essay on friendship, puts a high value on solitude. Youth, it turns out, is callow. I wonder if Deresiewicz is akin to Okakura here. If one reads that big shelf of books and is still self-absorbed, ambitious, and narrow, then something went wrong, he thinks. Joseph Epstein has written (I’m paraphrasing) that the only reason to go to an Ivy League school is so you don’t spend the rest of your life blaming your failures on not having gone to an Ivy. His point, or at least the part not about envy and resentment, is really very simple – that a good education is available at lots of schools – and I once thought it was clever and wise. Yet here I find a fellow who actually blames his failures, and those of many others, on having gone to an Ivy. Joe, you let me down. Tomorrow, I’ll give Epstein a chance to redeem himself. * For good reason – come back later in the week. ** There’s the possibility that this is all some sort of Swiftian provocation, by which I mean, all made up. I’m not so good at recognizing those. Great art is that before which we long to die. "The inros, the netsukes, the sword-guards, and the delightful lacquer-work articles of the period, were playthings, and as such no embodiment of national fervour, in which all true art exists. Great art is that before which we long to die. But the art of the late Tokugawa period only allowed a man to dwell in the delights of fancy." Kakuzo Okakura, The Ideals of the East (1904), Stone Bridge Press, p. 121. Toss in, with the lacquer boxes and inros, the woodblock prints of Hiroshige, Hokusai, and others. I left out that part of the quotaton - it was a bit too wordy. Okakura is presenting us with a Buddhist version of the sublime, art as annihilation, art as something bigger than we are, something that could crush us. That line about "national fervour" has an unpleasant odor, but it's a logical extension of the idea: Real art, great art, is important. Important! I should try to reword Okakura's passage into its exact opposite, then adopt it as my motto. Great art is that before which we long to live. Inros and lacquer boxes, Hokusai and Hiroshige, are playthings, and embodiments of individual creativity, in which all true art exists. The delights of fancy are exactly what I want from art. Surely there is room for more, though. This week I will try, probably indirectly, and time permitting, to challenge myself a little. Perhaps I'm too suspicious of the sublime, too sceptical of ideas. Let's think about it. Inros, if you don't know, are Japanese lacquer medicine cases, hung at the waist by a sort of button, the netsuke. I know them from the collection on the second floor of the Chicago Field Museum, which contains nothing but wonder and delight. Cats and frogs, children and fat little monks, the rabbit in the moon - lovely things. My favorite objects in that museum, way better than Sue the T. Rex. Okakura was the crucial link, for decades, between Japanese and American artists and intellectuals. He crossed paths with everyone. His story, very much worth knowing, is told in Christopher Benfey's The Great Wave, where Okakura appears in many chapters. The Ideals of the East, written in English, was an influential account of Asian and Japanese art history and aesthetics, mostly traced through the international flow of ideas about Buddhism. It is probably only worth reading for people with a particular interest in Japanese aesthetics, or in the history of the exchange of ideas between the East and West. Poems improvised and recited by a murderous Viking at key moments in his life. That last one is not quite the swerve that it might seem. Each of these examples is a challenge to my idea of what a poem is, how a poem is used, what is the point of the exercise. I could add more examples, some of which I have mentioned in recent weeks - Japanese poetry anthologies on long, decorated scrolls, art objects themselves. Or Arabic poems with calligraphy so abstract that the original words are nearly lost. I see myself sitting in my armchair, leafing through an issue of Poetry, or reading through a selected poems of one famous poet or another, or trying to crack** the poems tucked away in some random corner of The New Republic or The New Yorker. Yes, this one's very nice; no, I don't really get that one. What possible relationship can there be between what I do and 1,000-year-old scrolls inscribed with the complete results of Heian-era poetry contests? Songs are the one area for most of us, certainly for me, where poetry moves off the page somehow. Many of the greatest German poems, by Goethe and Heine and others, are now irrevocably tied to Schubert and Schumann and Wolf, at least for listeners with some German. English literature has not been so lucky, the lieder tradition less successful. (Recommendations very welcome here). So I mostly, almost always, read better poems than I hear. Cole Porter's best lyrics are better poems than many of William Wordsworth's poems, but they are sure not better than Wordsworth's best. Lil' Wayne sometimes, when not rapping about pointless garbage, puts together a long string of slant rhymes that are remarkable things. But heck if I'm going to sit in that armchair reading a book of Lil' Wayne lyrics. The world is always bigger than I think it is. * My luck was quite good today. The fortune I bought at the Tsuru-ga-oka Hachiman-gu Shrine in Kamakura tells me that my marriage will soon be settled, if I listen to advice, but that I'll have a slight illness. Overall, pretty good news. ** Like a nut, or a safe. *** If I were a better blogger, I would find links to some examples. Poems about a cat that look like a cat, that sort of thing. The curved ribs of Ketil. Yes, I know, it's difficult to tear oneself away from the formal beauty and stirring sentiments found in this poem. Please, wipe away your tears so I can continue. That's just a little taste of a poem that runs four pages. The King - obviously - gives Egil his freedom. Ah, poetry, beautiful poetry. I may be exaggerating certain propensities of Egil's poetry through selective quotation, but just barely. These admirable translations are from the Penguin edition, Hermann Palsson and Paul Edwards the translators. The first, above, is a 17th century "poem about painting". The characters shrink dramatically after the first four (you can see a hint of that if you enlarge the photo), and then shrink again halfway down the scroll. Some sort of orthographic effect. The second, shot from the head down, is also from the 17th century. 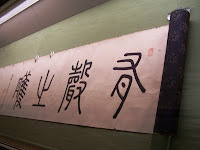 The poem consists of exactly 1,000 Chinese characters, none repeated. Chinese influence on Japanese art ebbed and flowed. These scrolls date from a period of flow, a torrent. Both are in the Tokyo National Museum, amidst a heap of treasures. I wish I knew how to photograph the paper used for some of the 1,000-year-old calligraphy, for example, a mix of bamboo and linen, dyed indigo, with fleck of gold leaf mixed in. Shockingly beautiful. Imagine reading a book handwritten on paper like that. Imagine the $10,000 the book would cost you. That piece ought to be here, but I can't find it. So many other nice things to see, though, that you might not care. Colour and perfume vanish away. What can be lasting in this world? It is but the passing image of a dream, and causes only a slight trouble. from Lady Isabella Bird, Unbeaten Tracks in Japan (1880), Letter 10. Bird notes that this poem, memorized by all of the Japanese schoolchildren, has some resemblance to Ecclesiastes, and "is a dismal ditty for young children to learn." The curious thing is that the poem is actually mnemonic device. It contains all 50 or so Japanese syllables. Ka, ki, ku, ke, ko, and so on. That's why all the children know it, like the ABC song. The wiki for the hiragana alphabet has the Japanese version (three quarters down). Each syllable is used only once, so it's a real trick poem. Wiki claims that the poem dates back to the 10th century, which is either preposterous or amazing. Citation, please. 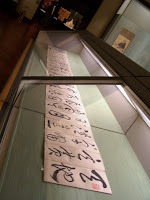 The Meiji Emperor of Japan, who ruled 1868 to 1912, wrote, I am told, 100,000 poems, all in the 31 syllable waka form. 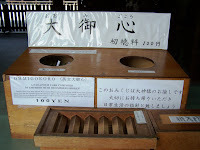 At the Meiji shrine, built in his honor in 1920, one can buy one of his poems for 100 yen, less than a dollar. Just drop a coin in the slotted box, then take a random poem from the hole on the right. 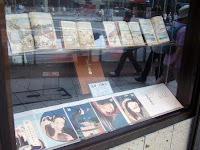 Or one can buy a poem written by his wife, the Empress Shoken, at the charm shop. She had more to do, apparently, and only wrote 30,000 waka. Shake the can until a chopstick comes out, then show the number on the stick to the kimono-clad attendant so she can find the correct poem. It should be obvious that there are not 100,000 poems in that box, or 30,000 chopsticks in the shaker. Someone has edited the corpus down a bit. Is this true? I have doubts. There are plenty of trifling acts in our lives which don't deserve that much care. Moderation in small things, right? Maybe I shouldn't take this so literally. At a different shrine, I bought a random fortune (a bad one), also for 100 yen. The bad fortune was pretty accurate; I haven't quite fit Empress Shoken's poem into my life yet. 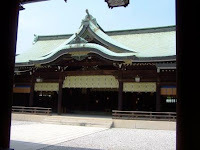 Here's a glimpse of the Meiji shrine, tucked away in a cool, lovely forest, surrounded on all sides by shopping, shopping, shopping. If you have the proper equipment, you may be able to see the two butterflies that danced around the whole time I was there - see, over the railing on the right. Let's see. What's in MyPictures. Hmm, hmm. Is this guy depressed because he couldn't find the book he wanted, or is he groaning from the weight of books in his backpack? Or does he look like this all the time? This I'd never seen before. 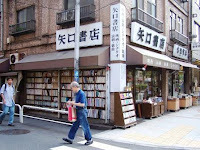 A bookstore with so many books that it has shelves in the street. There's an awning and a curtain, nothing else. 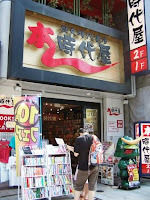 Some of the bookshops also sell Japanese prints, original and otherwise. Notice how the Amateur Photographer artfully preserves his anonymity by not photographing his reflection. 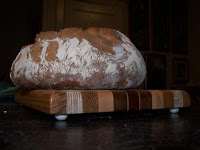 Now this seems too be a giant loaf of bread baked by ma femme just before I left for Japan. Why do I have this photo with me? Why didn't I bring any slices with me? I need to get out and take some more photos of Tokyo. 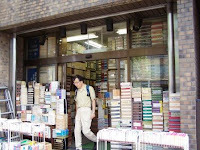 A short stretch of the Jimbo-chi neighborhood in Tokyo is crammed with bookshops, dozens of them, one after another. They mostly look like the one to the left, except that they do not all have the cartoon samurai statue. They did have - I swear, every one of them - the outdoor browser. Almost every book in almost every shop is in Japanese, so these shops were not much use to me, aside from the pleasing thoughts about humanity a crowded book shop can engender. I also like that, very thoughtfully, they are all on one side of a busy street. 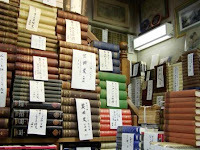 The Subun-so shop specialized in foreign language books - English, overwhelmingly, and German and French. It was not much use to me either - see right. First editions and gigantic multivolume sets. The Centennial Nathaniel Hawthorne in twenty thick volumes, that sort of thing. Hume's History of England in six volumes - that one's bottom center in the photo. Those are not going home with me. Now here's a view of books you don't get very often. Keenly aware of the problems of body as well as mind, a similarly packed stretch of the same street is devoted to sporting goods stores. Snowboarding equipment, mostly. And apparently if I had turned there rather than here, I would have found Tokyo's musical instrument shops. The books, violins, and snowboards are all within a half mile of each other, maybe less. 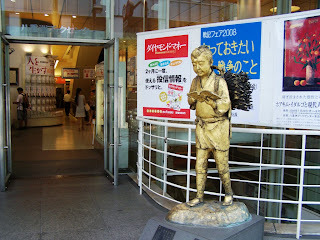 This little fellow, who loves books so much* that he reads while hauling firewood, is standing outside of the Yaesu Book Center, eight floors of books, in downtown Tokyo. I'll bet some sort of story is attached to this statue. I'll bet it's literally attached, on that plaque at his feet. Anyone have a guess about what the story might be? * Unless the book is "How to Get a Job that Does Not Require Hauling Wood" - then his motivation may be something other than love of reading. Chop off the good bits and hang them on the wall. This was once a piece of a long scroll dating from the 16th century, and is now a wall-hanging. It is still hard for me to comprehend that those few characters to the left and right of the deer make an entire poem. Click the picture for a better view. I didn't say great, I said better. 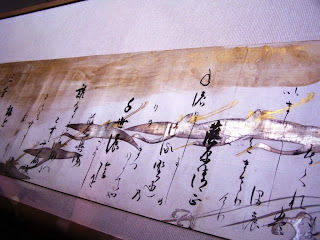 A 16th century Japanese poetry anthology, a 17 meter long scroll. Only about 8 meters are on display. Click to enlarge; oh yes, do. 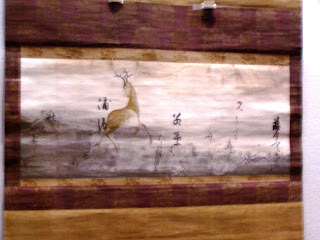 Picture taken in a slow-moving crowd at the Tokyo National Museum.